There are many types of moths which can become a nuisance around outside lights. Commonly known as Miller Moths, there are actually many different species which appear during the warm months of the year. The scope of this article is not intended to identify these species nor offer in depth biological information about any one type. Instead, we will concern ourselves with why these flying insects are a problem in and around the home and then offer ways to control local infestations. Miller Moths started to become a problem for man as soon as we began taking artificial light outside. This was done for much the same reason it is done today; light enabled people to see outside when it was dark. Though street lights rarely create problems involving moths, entrance lamps, patio and doorway lighting along with any decorative lights placed just outside the home can become the focal point of a never ending supply of night time flyers. Such flyers include mosquitoes, gnats, katydids, wasps, beetles and mayflies. However, the most common nuisance night time flyer is undoubtedly the Moth. Similar to butterflies, moths are actually the adult stage of an insect which hatched from an egg. The first stage is a worm or caterpillar which generally can be seen in spring. Overwintering pupae will hatch out as adults as spring arrives and they’ll start laying eggs throughout yards identified as good nest sites. Eggs will hatch young larvae which will feed on grass, plants and trees and then undergo metamorphosis mid to late summer. At this time you’ll see a surge in the local moth population around the yard and in some cases, their numbers can be over bearing. As the adults land on homes, their presense will leave mess. In fact this is why so many local moths around the world acquired the nickname “Miller Moth”; they have a powdery dust-like material on them which reminded people of the dust found on the clothing of the local Miller. 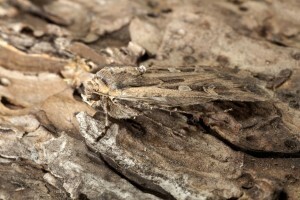 Unlike the local problems common throughout the eastern half of the United States, the western half of the country has migratory miller moths. These moths will fly hundreds of miles in the spring and summer moving from lowlands to mountainous peninsulas. Macro photo of Miller moth Euxoa auxiliaris. In its caterpillar stage, the army cutworm may damage crops, including alfalfa, winter wheat and gardens. Spring flights of miller moths move east to west across the eastern half of the state from moths that developed across eastern Colorado. They fly west and ultimately settle at higher elevations. During these migrations, they will magically “show up” overnight in the yard and on the home. The exact reason for the migration is unclear but they definitely follow a very distinct path. And if your home is in their travel line, you’ll experience an invasion of sorts which will last 1-3 months. Typically this happens in the spring to summer months and when they’re on the move, yards can go from zero to thousands of moths overnight. All the while they’ll be marking territories leaving their scented pheromones on good locations and travel paths to insure the success of future generations. This means they’ll return year and after year to the same yards and homes as they make their annual trek. Since moths rely on their sense of smell for mating and reproduction, one moth active around a light or yard will generally lead to several. This is because the pheromone of any one female moth is very strong and can attract males for miles. If you get a female moth flying and banging up against the side of your home, her scent could persist for years and long after she is either gone or dead. This scent will many times attract males with one thing on their mind. So strong is this urge that they will literally “camp out” waiting for her to return. Expect to see moths hiding in cracks along house siding, under the light fixture and up under the soffits of the overhang. Spot lights which are placed high up under soffits offer all the protection any moth needs from the rain and wind and most find this area quite comfortable. Unfortunately, such populations will often times lead to mating and egg laying right on the building. If there is a ready supply of vegetation close by, expect the moth larva to start feeding on it as soon as they hatch. This could turn out to be some prized flower or shrub so in general you don’t want moths laying eggs on and around the home. Once you start getting moths spending their days roosting on the side of your home, expect to find some inside. Common areas where they will start to appear will be in garages, mud rooms, patios and crawl spaces. Though seemingly harmless, their roosting will almost always lead to mating and egg laying. Furthermore, their wing dust can create a mess. Many people have allergies to this dust and high levels in living areas should be avoided. And since their young will forage on such a wide range of common household fibers and fabrics, damage from hatching larva could occur most anywhere in the home. For these reasons, it is best to keep outside populations to a minimum. This can be accomplished with a wide range of products. The key is identifying which one is best suited for your application needs. For mild levels of activity, there are two types of aerosols which will provide good control. The first option is to manually spray AQUACIDE AEROSOL. This pyrethrin based aerosol works quickly on all flying insects and it only takes a little bit to treat any room. 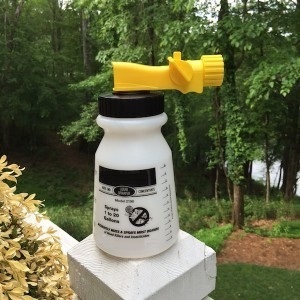 It will provide a quick knockdown and is an excellent choice for space spraying enclosed patios, garages, living rooms and other areas of the home where moths have been seen. It is safe enough to be applied with people in the home and re-entry time is just a few minutes. Though it won’t provide any residual, it can be applied daily as needed. It can also be used outside for small areas. 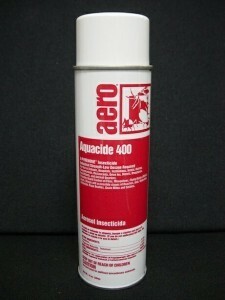 To treat the average 15 foot by 15 foot room, spray Aquacide into the air for 5-8 seconds. Treatments will last a few hours and may be needed a few times a day. For sheds, barns and homes with heavy activity, AEROSOL MACHINES may be the best option for long term “automated” control. These small machines can be hung on the wall or set on a shelf at least 6 feet high. They take 2 “D” cell batteries and will release a small amount of aerosol on a schedule you control. The aerosol is pyrethrin based and by constantly renewing the treatment, miller moths won’t be able to fly in the treated zone or else they’ll die. Set up one machine for every 400 sq/ft of area and fill it with CLEAR ZONE REFILLS. The refills are safe for use in the the home where pets and people are active but will also work outside on decks and patios. Cans will last 30-40 days when set to go off every 15 minutes and by making the treatments automated, there is no chance of forgetting which can lead to ongoing problems. 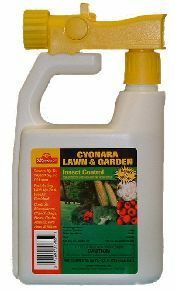 If you have large populations of moths congregating in the yard outside the home, spray all plants and turf with CYONARA RTS cThis odorless concentrate comes with it’s own hose end sprayer, can be connected to your garden hose and uses the power if your water faucet to spray. This means it can usually reach high and with Miller Moths, this can be important. Cyonara is odorless, works well on all species of moths and will last 3-4 weeks per application. One jug of Cyonara will treat up to 16,000 sq/ft and should be renewed once a week until all activity stops. Once they’re gone, treat once a month to make sure they don’t come back. If you have a big lot and expect to be spraying on a regular basis, BIFEN XTS will prove to be the better concentrate to use. Its a bit stronger and a little bit goes a long way. In fact 1 oz of Bifen XTS can be mixed with 5 gallons of water and will cover 5,000 sq/ft. Like the Cyonara you should treat weekly until the moths are gone; once a month to make sure they don’t come back. You will need a good HOSE END SPRAYER to apply the Bifen. Using this sprayer, you’ll need to add 1 oz to the tank and then fill it with water to the 5 gallon line. Next, put the top back on and hook it to your garden hose. The entire amount inside can be sprayed over 5,000 sq/ft to take care of any miller moth activity. If you have miller moths landing on the home, spray it with ONSLAUGHT. This product is very unique in that applications can last up to a year. Now this would be stretching it a bit but we have found that when applied to protected areas, you’ll no doubt get 6+ months of protection making it extremely effective for anyone that needs long lasting residual. Onslaught will work best when applied to non-porous surfaces but can be used on cement or any kind of house siding fine. And it works well on many pests too. Its repellent to moths too so they’ll avoid where its been applied. Mix 1 oz per gallon of water and spray the mixture over 500 sq/ft of siding where moths are congregating such as light fixtures, around windows and doors. When homes are treated in the spring, its long lasting residual will provide moth control for the whole season and since it works on so many types of insects, perimeter invading nuisance pests will all be kept minimized following its use. It’s odorless too making it easy to work with. Use a regular PUMP SPRAYER to make the application and be sure to renew the treatment before they arrive. Two “mechanical” moth killers worth mentioning is the HAND HELD ZAPPER and the LIGHT TRAP. The Hand Held Zapper is a small device which is able to charge a large grid with electricity. Once charged, merely touching any moth will kill it on contact. This device is fun to use and takes the mess out of killing most any insect when you have a nuisance pest that won’t go away. Just push the small activation button located on its handle and then place it over a moth which has landed or hold it out where one is flying. Once the targeted insect touches the grid it will become paralyzed and die in a moment. Clean up is easy. Just dump the carcass in the garbage or out in the yard for recycling. Since the Hand Held Zapper is a great tool for Mosquitoes, Wasps, Bees, Roaches and Spiders, it has many uses in and around the home. The second option is to install one of our 110 VOLT LIGHT TRAPS. 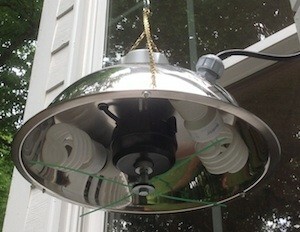 Since Miller Moths are attracted to light, there is a unique trap available that’s perfect for use around the outside of your home. 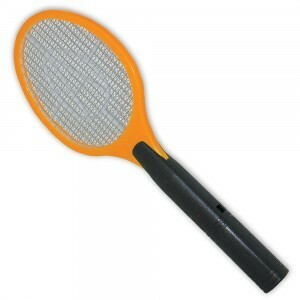 Its the only one strong enough to kill miller moths since standard “bug zappers” won’t do the job. Like traditional bug zappers, this trap uses light to attract flying pests such as miller moths. But what’s special about this trap is how it kills the insects which come too close. Basically it uses a heavy monofilament line, much like a weed whacker, which will shred insects as they fly toward the light. Just plug it in, hang it out and keep all other exterior lights off around your home (like deck, door way, flood, patio, etc.) to get the maximum effect. This trap uses very little electricity and includes a photo sensing cell so it remains off during the day and only goes on at night. Local moths will forage to the lights and get chopped up as they fly close to the fixtures. You may want to set a box or garbage pail under the trap if you have a lot of moths getting killed. This will make cleanup easy. But the dead insects make great mulch so if you can, position the trap over a garden, fish pond or any place where plants can use the food. Good article and suggestions but the moths that are at my home usually are only here for a short period of time. Due to weather or something I have a very high number of moths this year and they disappeared and have suddenly reappeared. My problem is not outside but inside. I very rarely turn outdoor lights on, live far from any outdoor lights, they do not congregate at the windows (which of course are lighted from within), they just “appear” in large numbers inside (crawling thru cracks I am sure but have not figured where). They are a problem in that they are attracted to beneath the water heater and have died there to such large numbers that they actually trip the safety and shut the water heater off! Mostly they are a nuisance flying around. Would the 12 volt unit be a good use for indoors? I have cats and a dog so am wondering about this. Thanks. You could set up a Light Trap in the room where the water heater is located. And the 110 Volt would be the better way to go for use inside since you’ll have access to a constant power supply. But what would be a more permanent solution would be to first vacuum out the area under the water heater and then dust it with some Pyganic Dust. This product will last a long time and make the area “unlivable” by them. I also suggest you do a thorough inspection outside the home trying to isolate the areas where they might be entering. These areas should then be dusted with the Pyganic Dust too so the moths can’t enter. This would be a much more direct and longer lasting solution. The millers are gone for this season. My question is how to keep them out of an rv that is stored outdoors. The camper was full of dead miller moths when we brought it home to get ready for vacation. Would the spray on the outside help? They leave a horrible mess. Not just dead millers but blood splatters everywhere. Help, please!! There are two treatments that will keep them out. First, you need to dust every crack and crevice they might use to get inside the unit. This treatment needs to be done from the outside using a dust called Drione and applying it with a Hand Duster. Just puff small amounts to every crack, seam, void and basically all the spaces they could use to hide and lay eggs. If any adult millers land on the dust, they’ll die. Same with any hatching young. This will mostly do the trick but next you need to spray. And the best spray to use on the entire outside of the unit is the Onslaught. It can last upwards of a full year but for miller moths, we recommend treating once in the fall and once in the spring. Basically use a standard Pump Sprayer and apply a few gallons to the outside of the unit. Like the Drione, it will repel and kill any adult miller moths that come around. We had small white worms crawling on kitchen ceiling that became Indian moths. They seem to come from inside the ceiling from cracks? They were not in any food stuffs but I threw everything out anyway. Now, when I get up in the morning there are 8 to 10 flying or on the ceiling that I kill with a swatter. How do I eliminate them for good and will they likely be back next year? First, read our Meal Moth control article. It will go over everything you need to know about this pest. As you’ll learn, the larvae leave where they feed when they’re ready to pupate into adults. So when you first saw them, it was after they had fed. And now since they were able to spin cocoons and pupate, you’ll have to endure what you’re finding for some time to come. The reason for this is that you can’t kill the pupae so only after they all hatch will the problem be over. Now what you’ll also learn is that you need to install Moth Traps ASAP. These traps will start collecting all the foraging adults. By catching them, they won’t be able to mate and lay eggs somewhere which would just enable the problem to persist. Additionally, all the cracks and crevices on the ceiling, in the pantry and anywhere else you believe they might be hiding should be treated with Dforce Aerosol. This way any more that forage around won’t have a chance to spin cocoons and become adults. We moved into a new construction (town home) and there has been a steady stream of 10-15 new Millers every day inside our home. We do not keep exterior lights on but we do live on a golf course with a lot of water and trees. We live in New York so are heading into colder Fall and Winter months. Will they hibernate or perhaps die off during the winter and what are our chances of them returning inside our home again in the Spring? No doubt they will return next year. My guess is there must be a good food supply some where close to the town home on the common ground of the building and the adults are laying eggs there and stick around for future reproduction. Ideally treating the landscaping and siding of the home would really help. Permethrin is good for this and can be used safely on any type of plant as well as the home to both kill and repel this moth. Next, you should spot treat all the cracks and crevices of the home with PT-Microcare. This treatment will act as a repellent chasing them away but it will also kill any moths that choose to land and stay on a treated surface. Since miller moths like to nest and hibernate in any crack or crevice they can find, treating up into the siding can really help reach spaces the liquid treatments rarely (if ever) cover. Microcare can also be used inside to help cut down on the number getting into the living space so use it around windows, door frames, exterior wall voids, etc. Lastly, make sure you actually have miller moths! We’ve had many customers mistake Meal Moths for Miller Moths so I feel I should point this out just to be sure. Review our Meal Moth article to learn more about this pest since they’re so active this time of year too. It is September 8th and the moths are swarming. I have never seen so many, they seem to be homesteading in my Encore Azaleas that are blooming. I have sprayed with every kind of flying insect spray I can find and they are still numerous. Where can I purchase these products that you mention. I need help immediately. Thanks in advance. Since our products are highly specialized with limited distribution, you can only get them through us using the links above. So simply “click” on any product you’d like to get which will put you on our product page and from there, you can add the item to your cart, etc. The links above will be where the item is “underlined” or in blue colored text. Now for miller moths on shrubs, the Cyfluthrin or Onslaught works well and will provide a quick kill. Just be sure to treat every bush or shrub where they’re active. I found a huge moth in my closet, ugh! And it tried to attack me!! Are they the same as the hundreds hounding my garage which appear much smaller? Most likely. Anytime you allow a large population of insect to exist either on or alongside your home, the chances of some getting inside are high. And since you state you have months “hounding” your garage, it would only make sense that some get inside. As our article explains above, miller moths will nest on homes unless you treat the exterior of the home with either the Cyfluthrin or Onslaught. As for inside; either spray can be used to treat carpeting and furniture but if the moths start hiding in cracks and crevices, use the PT-Microcare to spot treat. It’s easier to apply to small areas and won’t make a mess in sensitive areas. Will ultrasonic plug in devices keep miller moths away as we get up to 200 in the house daily in spring into summer. They make me sick and we have to hibernate in 1 room when it all starts. They’ll even fly into my refrigerator! Ultrasound unit will NOT help any insect population. We actually sell several models but we only recommend them for animals. In our testing and experience, sound does not repel any species of nuisance insects including miller moths so save your money and use it where you can get positive results. In summary, if you want them gone, you’ll need to treat the exterior of your home with the Cypermethrin listed above. It’s fast acting, easy to apply, lasts a month or more and is repellent to all kinds of pests. Surface treating the exterior of the home is all you need to do and they’ll stay away. And if you treat early enough in the season, there is no need for you to get infested as you’ve described during the summer. I have a Miller moth problem in my kitchen. We do not have the worms crawling out from the cabinets. We have birds and have to be careful about anything we use to treat this but we have to treat this. The problem seems to be getting worse. Please give any suggestions you may have. So if you believe the source of the problem is in fact centered in your kitchen, you’ll need to follow the treatment explained in our meal moth article. This means removing the infested food items (many times its bird seed! ), doing a thorough vacuuming of the infested area and then treating with Phantom aerosol. Make sure the birds are away from the area when you treat, like in another part of the home, and keep them out of the treated room for at least one hour after you treat and they’ll be fine. Phantom goes on dry and is odorless making it ideal for sensitive areas like kitchens or in homes where there are children or pets. You should also set out several Moth Traps to help collect roaming moths. I’d say 4-6 would be smart. Hi. We have about 100 moths on the outside of our house. I am not seeing any on my next door neighbors. Why would they be on one house and not any others? Thanks. 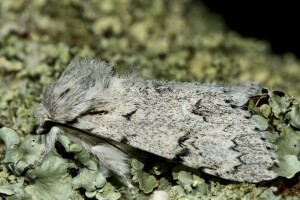 As explained in our article above, there are generally two things that attract miller moths to any one home. The first is light. So in most cases, any home that’s light colored or has light fixtures by doors, decks, patios, etc. is bound to attract some miller moths at some point during the year. Now once the moths start coming around, any females that land on the home will leave their “scent”. This odor can attract male moths for miles away. These males do nothing but spend their time seeking females. Additionally, pregnant females will use any structure that wreaks of old female scent because if a home is “marked” with female scent, it must be a good place for miller moths to lay eggs. So at this time you no doubt have a good amount of miller moth scent active on your home. Mind you its nothing that people can detect so don’t expect to be able to smell it. But to a miller moth this odor is important. And unless you remove the scent and treat the homes exterior with some of the products listed above, its highly likely this problem will persist. Now to remove the odor, the only product we can recommend is NNZ. Used mostly for smoke, dead bodies, feces and urine, NNZ is easy to apply and if sprayed on the homes siding, it will definitely remove old miller moth scent. However, just removing the scent alone will not solve the problem – especially if there are miller moth eggs on the structure. So in the end, whether you decide to remove the scent or not, you should also spray the homes exterior siding with either the Cyonara RTS or the Onslaught (both listed above). The Cyonara would suffice if the area involved is small and you don’t mind spraying 1-2 a month. But if you want longer residual, go with the Onslaught. Treatments using Onslaught can last 3-6 months and sometimes longer. This will save you both time and chemical in the long run making the Onslaught the better choice. This is especially true if you have to treat 2-3 sides of the home. I have moths swarming on my lantana plants. They land on the flowers and are getting more numerous. Can you give me information on how to get rid of them? If you read the article above, you’ll learn about the various options we recommend which will handle this pest. The most common for use on plants is our Cyonara RTS. This product hooks to your garden hose and then mixes automatically when you turn on the water and spray. Cyonara is odorless, works on a wide range of pests and will both kill and repel them from treated surfaces making it ideal for large areas. 1 Quart will cover up to 1/2 acre and you may use it on the home too if you find them landing there laying eggs. We recently had a moth infestation in the area this summer– think I have the outdoors under control but got some in the house– they are in my oriental rugs- have sprayed the rugs with Pyrethin based spray on both sides and vacuumed several times– read an article about dusting to kill the larve– what is your suggestion and do you have something to help this issue? If you review the article above, you’ll see we recommend the Aerosol Machines for use in the home where moths are active. These will work around the clock killing all active moths so they can’t mate and reproduce. The refills use pyrethrin as the active so you need to keep them running for at least one month to successfully break the cycle that’s probably been established. You should also spray all carpets, furniture and place mats with Onslaught and Nylar. Unlike the pyrethrin you’ve been spraying, Onslaught will provide a long lasting residual and the nylar will prevent eggs from maturing into adults. We live in Colorado, on 3 acres of mostly ponderosa pine. Each year, the Miller moths are quite unbearable. I plan on spraying the outside of our house (siding, soffit…) with onslaught but wondered if you recommend I spray the trees with biffen xts as well. We don’t have grass or bushes yet, just dirt and trees. Would this be helpful? It would definitely be helpful. Spraying any trees close to the house as well as the turf with XTS will prevent them from nesting/laying eggs in the treated zone. Spraying the home’s siding with the Onslaught will keep them off the home. And you also mention that a reason moths are attracted to certain areas is because of the scent left by previous moths. Is there a way to get rid of the scent before moth season? Or does the siding spray cover up that scent? There is. Use it on the siding. Designed to take away animal and insect pheromones, it won’t hurt plants, grass or trees but will neutralize odors instantly. Thank you! Should I apply the sanitizer before or after onslaught? Ideally a thorough application with the NNz first and then letting it sit for 1 day would be ideal. This would allow it to neutralize all kinds of scent. A day later spraying it would be fine and then after you get through the season, doing another NNz treatment would be perfect.